Although Bauble can be extended through plugins to support alternate import and export formats, by default it can only import and export comma seperated values files or CSV. There is some support for exporting to the Access for Biological Collections Data it is limited. There is also limited support for exporting to an XML format that more or less reflects exactly the tables and row of the database. Exporting ABCD and XML will not be covered here. Importing files will most likely destroy any data you have in the database so make sure you have backed up your data. In general it is best to only import CSV files into Bauble that were previously exported from Bauble. It is possible to import any CSV file but that is more advanced that this doc will cover. To import CSV files into Bauble select Tools‣Export‣Comma Seperated Values from the menu. After clicking OK on the dialog that ask if you are sure you know what you’re doing a file chooser will open. In the file chooser select the files you want to import. To export the Bauble data to CSV select Tools‣Export‣Comma Seperated Values from the menu. This tool will ask you to select a directory to export the CSV data. All of the tables in Bauble will be exported to files in the format tablename.txt where tablename is the name of the table where the data was exported from. This is the way to import data into an existing database, without destroying previous content. A typical example of this functionality would be importing your digital collection into a fresh, just initialized Bauble database. Converting a database into bauble json interchange format is beyond the scope of this manual, please contact one of the authors if you need any further help. Using the Bauble json interchange format, you can import data which you have exported from a different Bauble installation. when you activate this export tool, you are given the choice to specify what to export. You can use the current selection to limit the span of the export, or you can start at the complete content of a domain, to be chosen among Species, Accession, Plant. 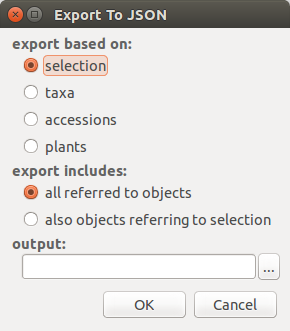 Exporting Species will only export the complete taxonomic information in your database. Accession will export all your accessions plus all the taxonomic information it refers to: unreferred to taxa will not be exported. Plant will export all living plants (some accession might not be included), all referred to locations and taxa.